Ben’s enthusiasm for pianos is infectious and his showroom is fantastic. We bought our first piano from Ben several years ago and got great service and advice, and an excellent starter piano for a very reasonable price. Since then we?ve looked forward to seeing him each time he comes to tune the piano as he is probably one of the most cheerful people I have ever met and a font of wisdom for all things piano related. We were finding it difficult to practice due to complaints from our neighbours (my playing, not Ben?s piano!) and Ben Recommended we get a silent piano. Even though he already had two other silent pianos in stock he ordered a Kawai K200 ATX so we could try it as he thought it would suit us the best, and he was right. I would recommend that anyone buying a new Kawai piano should seriously consider the ATX (silent piano) option if it is available and affordable. The online videos on the Kawai website really do not do it justice. I could write an essay about how much the ATX feature adds to an acoustic piano, however I will try to summarise; 1) Even a digital hating purist would benefit from the silent function. You can practice literally whenever you want without disturbing anybody else. Although it is always more fun to play acoustically the digital piano sounds are surprisingly good, especially through the high quality headphones which come with the piano. 2) There are a host of other (non-piano) sounds which are actually useful and fun (two Harpsichords, Church Organ, Hammond Organ and three decent electric piano sounds (Rhodes, Wurlitzer and DX-7) to name but a few) The action is light and fast enough to play organ parts with ease. 3) There are more additional features than you could hope to use, but far from being mere gimmicks, there are genuinely useful functions such as a metronome/rhythm patterns, a record function and the ability to sync up with a computer or midi device. You can even vary the tuning temperament! 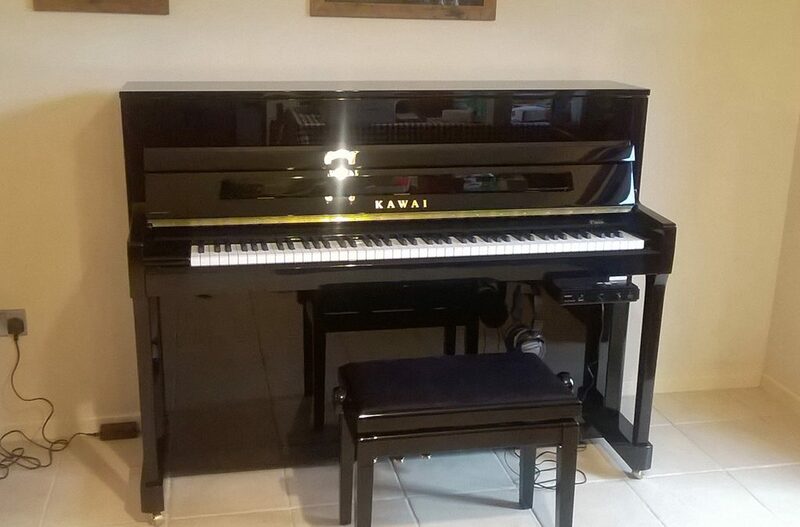 We are delighted with the Kawai and can?t sing Ben?s praises highly enough – Thank You Ben!